I'm baaaaack. Didya miss me? Hahaha. I didn't manage 2 weeks without polish. But the week and a half that I gave my nails has made a difference. No more peeling, mostly. And they don't look as icky. Anyhow, onto the polish. Here's KrisInPhilly's pick, N.Y.C. Molten Metal. I can't believe how long it took me to try this polish. I originally bought it on impulse. I saw it in the clearance bin at London Drugs so I grabbed it. I totally regretted buying it. But I assure you, there are no more regrets. This is amazing. It was a limited edition back in fall 2008. Molten Metal is a sheer purpley-pink jelly polish packed with silver glitter. It's got a very soft metallic look. Good for people who don't want just full on metallic on their nails. Overall, it looks like a purpley-bronzey silver foil. And as this is a foil there are no streaks. The picture is colour accurate. Three coats with top coat. It's wicked sheer at one coat. But builds nicely. I actually really like how it looked at one coat. This has a square cap, but it's removable and reveals a regular cap. The brush is flat, but not as wide as the pro wide. Oh I loves me some flat brush goodness. And please excuse the tip shrinkage. I think my Poshe is beyond rescue. Reminder: Tell me what you want to see here. Click the link at the top of my sidebar. Looooove this. It kind of almost sort of reminds me of Wet n Wild Shield, the way the particles sort of meld together to create that metallic look. Purdy purdy. I haven't seen this before! I'll be keeping my eye out for sure! Steph: I love polishes like that. It's how foils are made. Love them all. Me want! Is that in Canada only? I have not seen a bottle like that in the States. WoW! April and Sylvia: It was a limited edition back in 2008. But I'm sure not Canada only. I really like this polish! Hopefully I can find a dupe! That is awesome! Thank you. 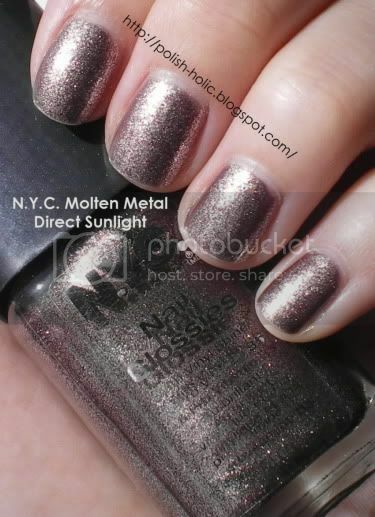 SeeingSunshine: I was thinking of a possible dupe, but the only one I can think of is Hard Candy Mr. Wrong. KrisInPhilly: Thanks for picking it. It made me try a polish that might have been left untried forever. This is so weird!! I just bought this polish at dollar tree for .50, came home, and immediately fell in love with the color. Am wearing it right now and am fixing to post it in my blog. What a small world. Hee. "Purpley-bronzey" is not a color description you hear very often. Very pretty! This is very pretty, love the metallic sheen. Same here. It looks really unique too.